The Žižkov Tower (Czech: Žižkovský vysílač) stands 216 metres (709 feet) tall and was built between 1985 and 1992. The Tower was designed by architect Václav Aulický and structural engineer Jiří Kozák. 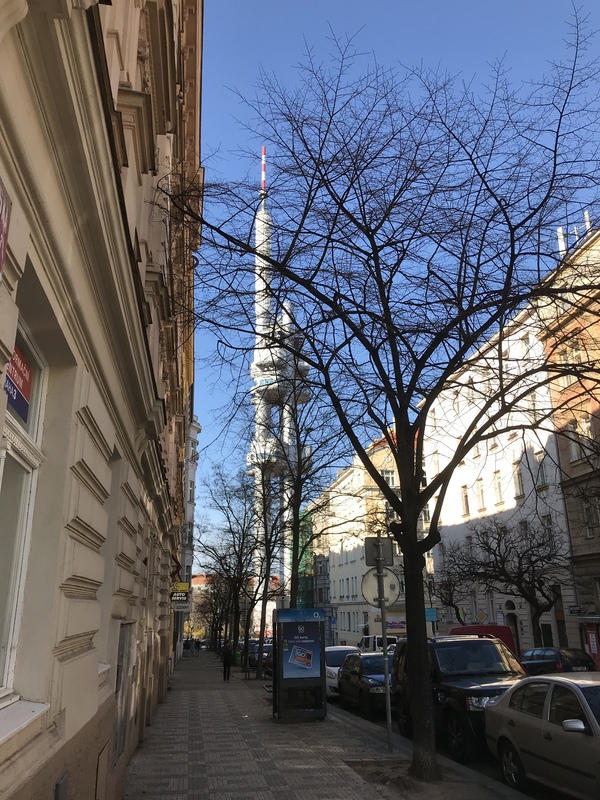 The design of the tower divides opinion among Prague residents – it certainly doesn’t blend sympathetically with the architecture of Prague. 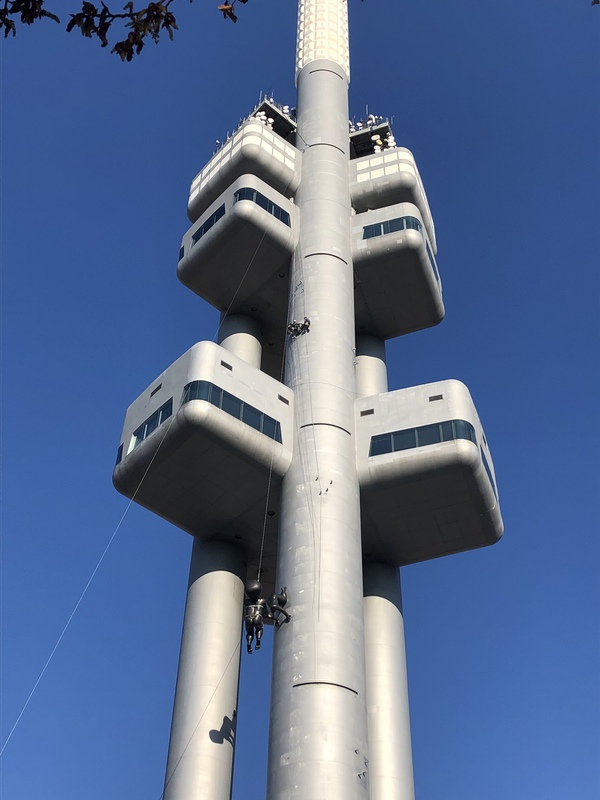 Imagine that someone attempted to make an alien craft using old washing-up liquid bottles and egg cartons, sprayed it silver, then PhotoShopped that into the Žižkov area of Prague. 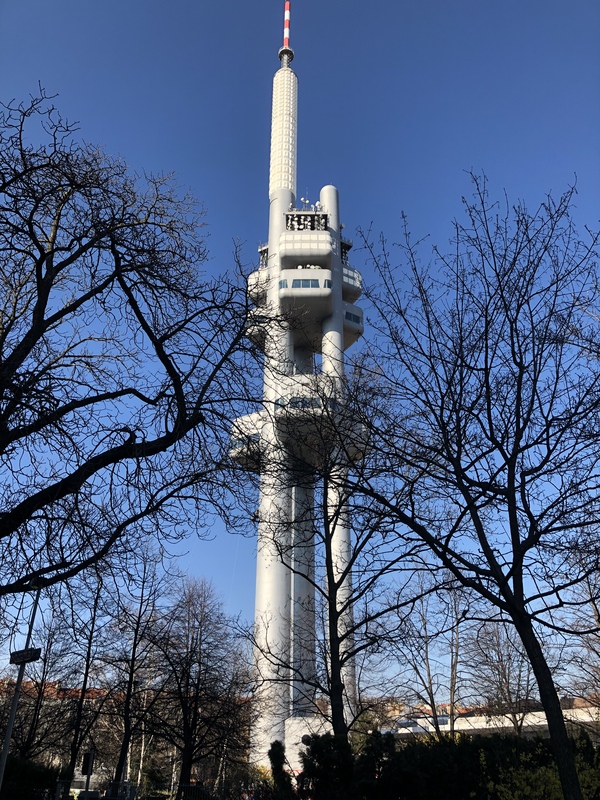 Being a fan of old sci-fi, including early low-budget episodes of Doctor Who and Blake’s Seven, I like the Žižkov Tower. There are nine pods reached by three elevators; three for transmitting equipment and six open to visitors. There is an observatory, a restaurant and a one-room hotel. 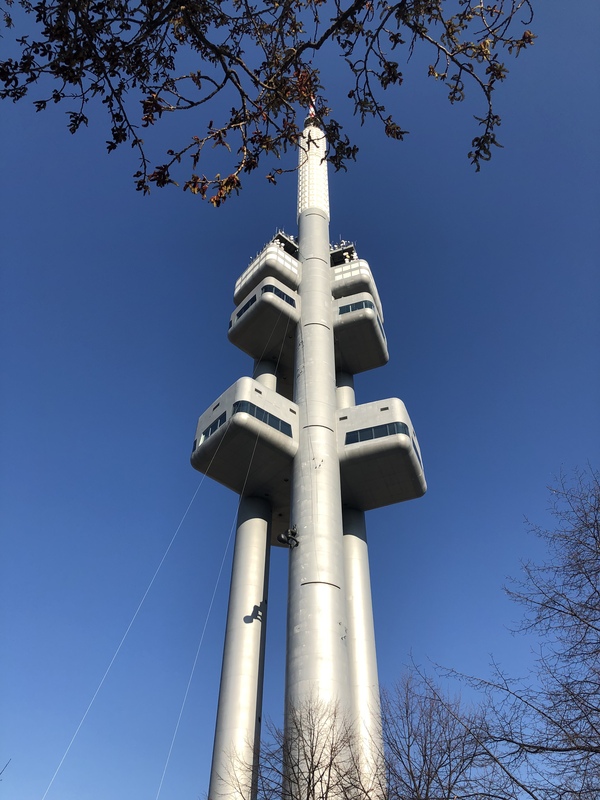 Sadly, like many city towers, the prices are ridiculously inflated; 250 Kč for the observatory and €549 (weeknights) to €849 (weekend nights) for the hotel room that has a 10am checkout time – breakfast and parking space generously included! The restaurant looks like it’s trying too hard, with a degustation menu including oysters, caviar, scallops and prawns – it isn’t clear if there is a fee to access the restaurant. 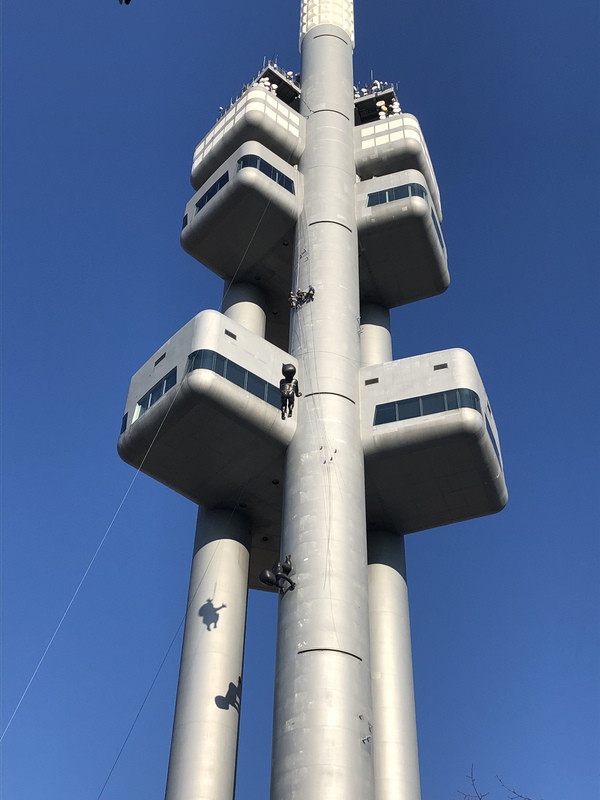 In 2000, ten fiberglass sculptures called ‘Miminka’ (Babies), by Czech artist David Černý, were temporarily attached to the tower’s pillars. The babies proved so popular that they were returned in 2001 as a permanent installation. The babies were removed in 2017 for cleaning and structural checks. The babies are now in the process of being returned. The first Miminko was attached on Friday 22nd March (I took this the day after). The second Miminko climbed the tower on Saturday 23rd March. This time I was there to watch. It was both exciting and painstakingly slow – I started to wonder if the Miminka crew were on double time rather than being paid per baby. I was able to get pretty close to the action – closer than the terrace of the Mininoo Restaurant, which was closed for safety reasons. 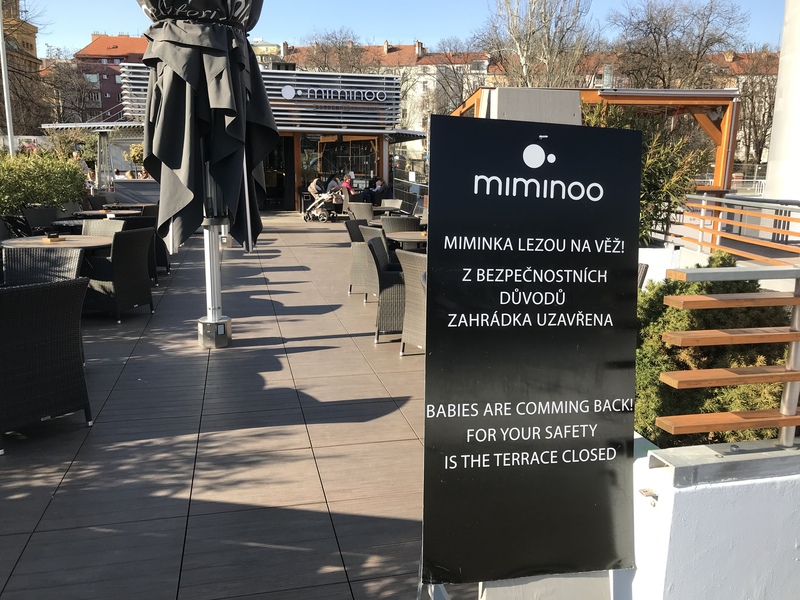 I’m amazed that one, they produced a special sign just for the occasion and two, that entry to the restaurant was via the closed terrace. I stood behind the restaurant. The baby was strapped into a harness and lifted by a cable. Then everything stopped, again, with one man holding a steadying cable. This was to allow a team above to abseil down the tower into position. Finally, the baby was allowed to climb the tower. 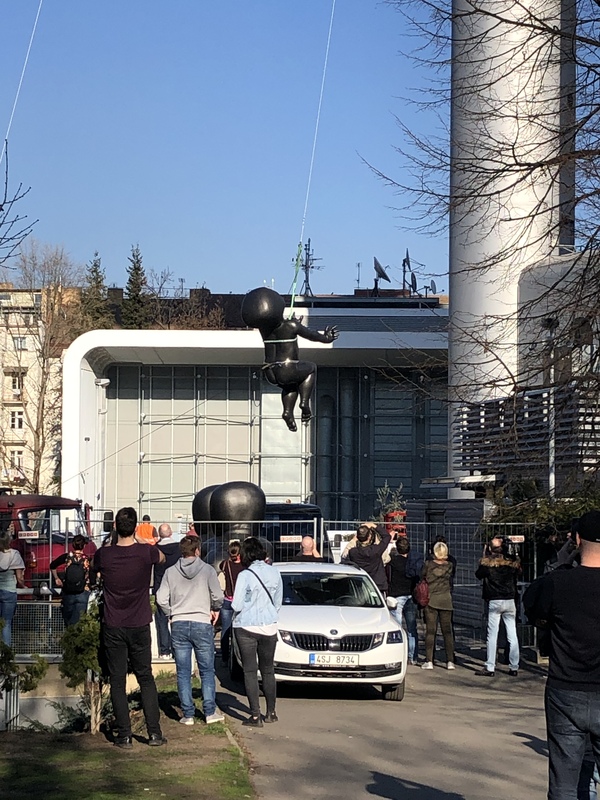 And reached the team who worked on securing the sculpture. It looked like this maternity ward only produced one baby per day and so we left. If you want to watch a baby climb the tower, you have at least eight days left – I’m assuming the ascension is weather dependant. If you want to get close up to three ground-based Miminka (made of bronze), take a walk through Prague’s Kampa Park. http://www.davidcerny.cz/ – an amazingly amateur website for such a famous artist. I hear that the new sculptures are heavier than the originals. Do you know the actual weights? Hi Franta – I read that the originals were 100kg and the new ones are 190kg.